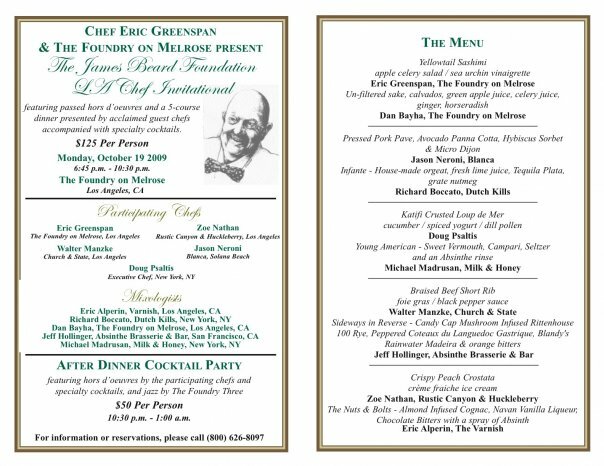 On Monday, October 19, Chef Eric Greenspan is hosting The James Beard Foundation L.A. Chef Invitational, an evening of fine dining and cocktails at his acclaimed restaurant The Foundry on Melrose. The event will feature passed hors d’oeuvres and a 5-course dinner prepared by Greenspan and guest chefs from Southern California. To pair with the food, specialty cocktails will be prepared by the Foundry’s Dan Bayha and mixologists from Los Angeles, San Francisco, and New York. After dinner, the party continues with hor d’oeuvres, cocktails and jazz. UPDATE: The L.A. Chef Invitational has reduced the dinner and cocktail party prices. Click the invite for the full menu and paired cocktail list. Featuring hors d’oeuvres by the participating chefs, cocktails, and jazz by the Foundry Three. For information or reservations, call (800) 626-8097.